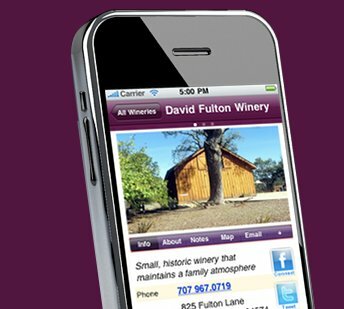 Discover over 240 wineries - narrow by your criteria - create itineraries - and map on the go! Need a family friendly winery that grows Chardonnay and is open for the next 2 hours? Narrowing functionality allows you to refine your search by choosing varietals, characteristics, hours, and locations that interest you – and find wineries that match your exact desires. Lost? Confused? Need one more stop before calling it a day? Mapping is easy with the use of GPS to assist you in finding your next winery, nearby wineries or the bigger picture of a route or district view. Where am I going on Wed afternoon? And Thurs morning? Create personalized itineraries to explore, plan, and even share with friends via e-mail. Unlike other apps that just allow you to add to a Favorites, you can create as many itineraries as days you will be in Napa Valley. Share your own itineraries with other Swirl Guide users or download those by other members. Of course, you can also share through email, Facebook, and Twitter. The next time someone asks about that special trip you made, you can easily share the details. Swirl Guide connects you to Napa Valley wineries before, during, & after your trip.